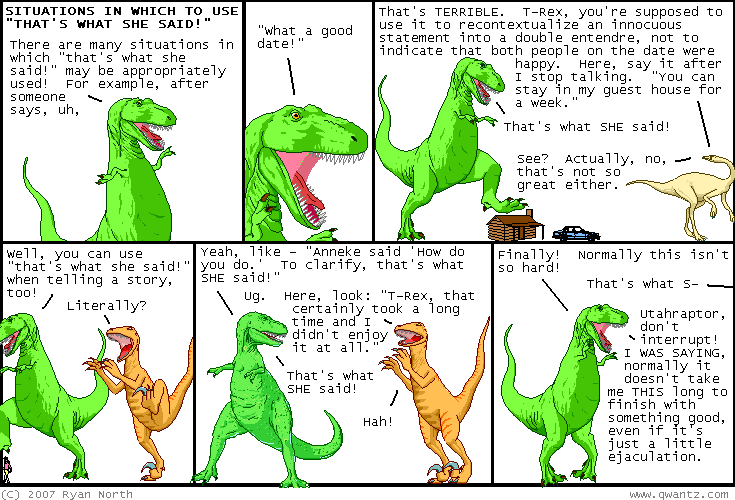 Dinosaur Comics - December 19th, 2007 - awesome fun times! December 19th, 2007: The extremely excellent website Square America collects found vintage photographs from the first three quarters of the 20th century. The strangeness and anonymity of these photographs, most of them meant for personal use and then discarded, make them really compelling. They're organized by theme: I recommend someone taking picture of women on TV, Defaced, The Pleasures and Terrors of Youth, Costume Party!! and really, every single collection on this site is fantastic! One year ago today: i would make informed opinions about archaeology comics, but my only archaeologist friend is in grenada!